As student-athletes train harder and compete younger, schools need more athletic trainers to keep them healthy. Athletic trainers help prevent and treat injuries, specifically muscle and bone injuries, not only for young athletes, but also for professional athletes and industrial workers. Athletic trainers guide the injured through recovery and aim to reduce future injury through exercises, therapy programs, and proper use of equipment. But don't make the mistake of confusing athletic trainers with fitness trainers or personal trainers, who help people become physically fit. Athletic trainers are increasingly in demand, particularly at high schools, while competition is stiffer for positions with professional and college sports teams. Athletic trainers held 16,300 jobs in 2008, and by 2018 that number is expected to climb to 22,400, a 37 percent increase, far greater than the average increase for all professions, according to the Labor Department. Because of low turnover in the industry, job seekers have the best chances of finding work where new positions are being created—in fitness centers, hospitals, and schools. Most athletic trainers work full time and have benefits. In 2009, median annual wages were more than $41,000, though salary varies based on experience, job responsibilities, and setting. The lowest-paid athletic trainers earned less than $25,500, while the highest-paid made more than $65,000. Athletic trainers advance by switching teams or sports to gain responsibility or pay. Those those who begin their careers at a high school may transition to the college or professional level. Some become athletic directors or administrators at a physician's practice or clinic. Others move into sales and marketing, using their expertise to sell medical and athletic equipment. High. While some athletic trainers work mostly indoors, others, especially those in sports positions, work outdoors. Certain jobs require standing for long periods, as well as walking, kneeling, and even running. Some positions require travel. Moderate. Many athletic trainers, particularly those in sports settings, work long hours, including nights and weekends. They often work under a licensed physician, collaborate with other healthcare providers, and communicate regularly with clients, so being able to work well with others is key. When employed by a competitive sports team, athletic trainers can feel stress from the pressure to win. A bachelor's degree is usually the minimum requirement, but many athletic trainers hold a master's or doctoral degree. Most states require athletic trainers to be licensed or hold some form of registration. 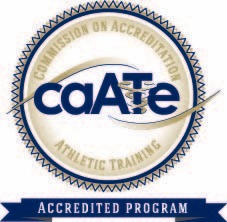 Employers often pay for some of the continuing education required for athletic trainers to remain certified. Positions at high schools that include teaching also may require a teaching certificate. Find an athletic trainer in your community and shadow that person to learn what the job's like and gain experience. To find that person, check out area colleges and universities, large high schools, or orthopedic practices. Choose one of the 300 undergraduate programs throughout the country that offer athletic training as an approved curriculum, so when you graduate from that program, you're eligible to take the national certification exam and get licensed in your state. "[Hiring managers] are looking for highly motivated people, self-starters with a strong work ethic. As [athletic trainers] interact with a student athlete, with a worker in a plant, with parents, they [have to be] great communicators ... The unique thing about all athletic trainers is work ethic. Their work ethic is unbelievable." —Marjorie Albohm, president of the National Athletic Trainers' Association.